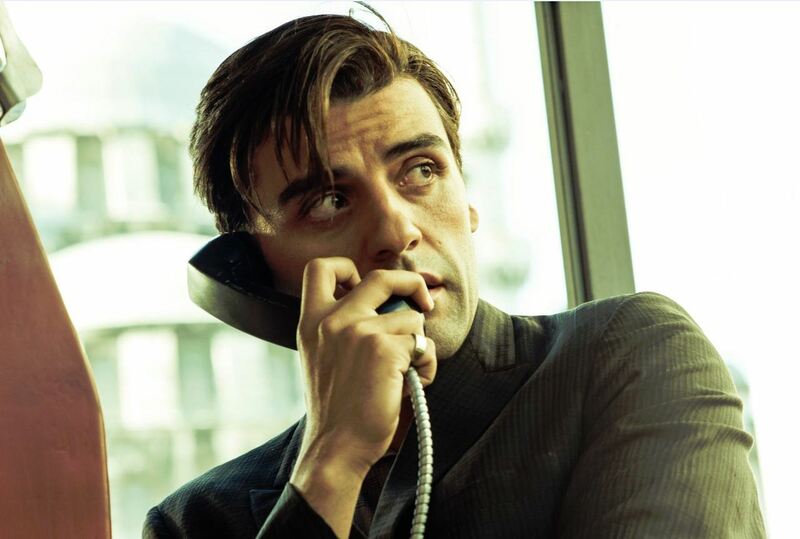 From the producers of Tinker Tailor Soldier Spy, the writer of Drive, and the author of The Talented Mr. Ripley, The Two Faces of January (12A) is screenwriter Hossein Amini’s directorial debut. The Two Faces of January stars Kirsten Dunst and Viggo Mortensen as Collette and Chester MacFarland, a glamourous American couple who befriend a tour guide, Rydal (Oscar Isaac), whilst visiting Athens. However, Rydal soon finds himself entangled in the MacFarland’s lives as it soon becomes apparent that none of them are what they seem. At a special screening of The Two Faces of January the film’s writer-director, Hossein Amini (HA), Kirsten Dunst (KD), Viggo Mortensen (VM) and Oscar Isaac (OI) discussed their experiences whilst making the film and the meaning behind its ambiguous title. Hossein, what was it in particular about the book that made you want to make the film? HA: I always loved crime thrillers but this is a crime thriller with three different, very ordinary characters who are very much like us. They are thrown into a world of crime and it is all about the damage that they do to themselves; there are no outside forces like policemen or criminals. The story is just about watching this very intimate triangle and the dynamics of the characters, and that is what I loved about the book. This is your directorial debut, how did you end up in the driving seat for this film? HA: This is the book that I wanted to do and I’ve been trying to get it done for 20 years and I’m sure a first-time director would make a lot of people very nervous but the cast and crew never treated me like a first-time director. Having been a writer for so long if they hadn’t let me direct I would have been happy to let someone else but I approached a series of producers over the years and eventually some got involved, I was very lucky because they believed in me and I believed in the book. Was it hard to get funding for this film as it was a smaller project? HA: It took 20 years! The reason for the classical style was to keep the illusion of the 60s and I felt even with all the big epic landscapes and backgrounds it is really a tiny, tiny story about three people and when you have three actors of this quality you can be quite simple and let the performances speak for themselves. It is very hard because it is a thriller and a drama, it is very much a quiet, slow burn and it is about the characters rather than the tension. VM: These movies don’t really get made too often and the fact that we actually got to go to all of the places made it an old-fashioned movie making experience. One of the really subtle things is the look of the movie, there are other movies from this period but this one becomes more murky and messier in a way; it is true to the period without being a bunch of postcards. Viggo, is there a reason why you tend to choose roles in smaller films? VM: It’s not a conscious thing, I just try to do good stories and you don’t find stories that are really good that often. You want to make a movie that you feel good about later, whether its next year or 10 years from now. KD: You need to be in movies that you would want to watch yourself. VM: It’s going to be the same amount of work so you might as well do something that you don’t have to go out there and think ‘what can I say nice about it’. I realise that there is a risk to doing small movies but I’m not worried about it and I have nothing against doing that if it’s a really good story. Did the four of you talk through the film a lot before you started shooting? Or did you just dive straight in? VM: Hossein got us all together a month and a half before we started shooting so that we can talk about things and if we had any questions about the three different relationships. So once we started shooting it was a lot easier than just showing up and trying to wing it, especially as it is one of those movies that is quite subtle. It is like a classic thriller noir movie and a lot of the behaviour and reactions are really subtle, same with the tone of the film and how it is shot. What’s great about it is that when you see it second time you see even more things about the character and the complexity of their relationships, most movies aren’t as good the second time and you start to see flaws whereas here it is the opposite. It is a delicate thing and it was really good to be able to talk it through as much as possible before we started. O I: There was an extensive pre-production, we sat for two days going over the script and I got to ask line by line ‘what’s going on here’ and it is because of that that we were able to create so many nuances and layer it. VM: Not too many writer-directors are that open about their scripts, especially someone who has worked on it for years. If you are smart like Hossein is you are open to changing things, many times it was his idea, we would be shooting and change it. Most writer-directors are pretty defensive about their work and that was really smart on his part and helpful to us because it was better to do it then than having the problem in the editing where you are forcing something to work and he was humble about it. What did you enjoy most about shooting on location? Were there any culture shocks? OI: I got really sick after having some bad shellfish! But other than that it was great, we had four locations and they were vastly different. There were the riots going on in Athens at the exact same time that we were there, so I would finish shooting and then wandered out to see where all the tear gas was coming from and there would be people running the other way with masks on! HA: it was great starting in Crete because we were in this beautiful town and everyone would walk to work and we would all bump into each other on weekends and it created a harmony on set. The great thing about these three actors is that they totally mix with everyone and we were all very much a team with the crew and everything. It was great that we started off like that as by the time we got to Istanbul we were in big cities again, so starting in Crete was a great bonding experience. KD: Yes, and we could swim after work as the sea was right there. It was amazing at the weekends! In the book Rydal is much more straight and narrow, why did you change this? HA: That was largely with Oscar, he was interested in that and so the script changed. For me, as a screenwriter, the collaboration with actors is so valuable; the actors are the best collaborators when adapting a part. Rydal is almost more infatuated with Chester than he is with Collette; did you think a lot about the father-son undertones of these two characters? OI: Rydal’s father had just passed away recently and he didn’t go to the funeral, and that influences his feelings when he starts to get close to Chester. One thing I love about Rydal is how you never really know if he is telling the truth and when he says ‘he reminds me of my father’ you don’t know if it is something he is just saying off the cuff or if he actually means it. Kirsten, w hat was it that drew you to Collette? KD: For me, the script was one of the best written materials that I had read in a long time and it is very hard to come across a well-written script. I know at first Hossein was thinking about maybe casting someone a little younger than me to have that innocence of the woman who married rich but what was more interesting was creating a real dynamic between us; a real husband and wife. Yes, she is a little bit disillusioned by the money and the glamour but I think that Collette really loves Chester and to make this dynamic interesting we needed to have a more filled out woman rather than just ‘the girl in the film’ – that isn’t interesting to me and I don’t think that it is interesting for anybody else to watch either. Collette appears to be the most innocent of the three and you mentioned that she is in love with her husband, Chester, however do you think that she is looking for a way out of her marriage through Rydal? KD: I don’t think Collette is innocent and I don’t think Chester would be with too innocent of a woman. She knows what he does but she just doesn’t need to know all of it; I don’t think that is innocent, it’s turning a [blind] eye and in the 50s that was okay and acceptable, she just thinks that it’s none of her business. As Chester starts to unravel I think that I am pushing his buttons because he is pushing mine and we wouldn’t be in this situation if it wasn’t for him. Your character seems to be quite similar to ‘the Hitchcock Blonde’, if you could go back in time would you like to have been directed by Hitchcock? KD: I heard that he was a real piece of work to his women but I have worked with a few pieces of work in my time and I think that I could handle Hitchcock! I definitely felt that this film had a Hitchcockian feel about it. Do you think both Chester and Rydal accept the father-son relationship in the end? VM: All three characters do things that would surprise you, all three characters are messy and at times they are embarrassing to watch and we were trying to get that feel across. It’s a really classy looking movie, but there are a lot of moments that are strange and there are moments where the characters don’t act in their own best interests and they surprise you. It’s very human, that seemingly erratic behaviour, you never know what’s around the bend and as an actor I like that all of the characters have a moment that makes you embarrassed for them. All three characters start high up and glamourous, and we all get lowered in the end. Finally, why the title ‘The Two Faces of January’? HA: January is the two-headed God, with the heads joined but they are facing different directions and I thought that was very symbolic of Chester and Rydal because they hate eachother and are fighting over Collette but they are somehow drawn to each other and can’t escape one another. The book is set in January too, which we lost due to the heat and the sun, but to me the god January says a lot about what the film is about. The Two Faces of January is in UK cinemas on 16 May 2014.